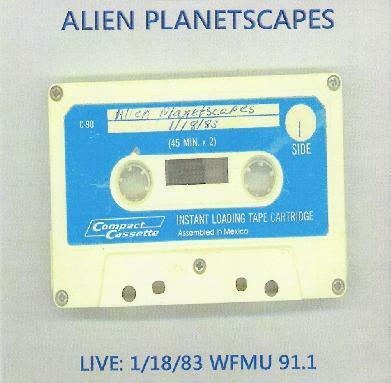 Alien Planetscapes - "Live: 1/18/83 WFMU 91.1"
Alien Planetscapes were a very unique freeform electronic space rock band from New York City. The leader of the band, Doug Walker, sadly passed away earlier this year, but several friends and past members are keeping the AP spirit alive and releasing a lot of unreleased and other material previously only available on cassette. This particular CD was recorded live in the studio in 1983 and features Doug Walker on synthesizers, guitar, flute and organ, Marc Adler on electric piano, keyboards and percussion and Louis Boone on synthesizer, tapes and percussion. The CD features one long starting piece, followed by an interesting discussion with the band about the NYC electronic music collective, followed by two improve pieces (one short and one long). The music is pretty damn far out experimental electronic music but it is quite fun to hear. These guys were making music way out there but they had control of it, which was pretty amazing. Cool stuff. For more information you can visit the Alien Planetscapes web site at: http://www.alienplanetscapes.com.